Forget whether you like Call of Duty or not. The thing to ponder today is whether the world likes Call of Duty as much as it used to. A swarm of vultures might be premature. Black Ops II has already sold millions of copies. And it's a good game (at least we think so). But 2011's Modern Warfare 3 has not sold as well as 2010's Black Ops and now a stock analyst is saying that they think Black Ops II is on pace to sell fewer copies than Modern Warfare 3. We are downgrading to Neutral from Buy due to 1) concerns on CoD sales; 2) potential downside risk to the Street's 2013 estimates; and 3) console transition-related risks next year. We still like the story long-term, believe EPS growth will resume in 2014 and the company's strong FCF, cash dividend and buybacks should limit downside. As such, this is not a "Sell" call. However, we think shares may have limited upside in the near term as Street estimates are revised downward. Call of Duty Showing Signs of Weakness.We believe unit sales of Call of Duty: Black Ops II are tracking down double digits y/y. 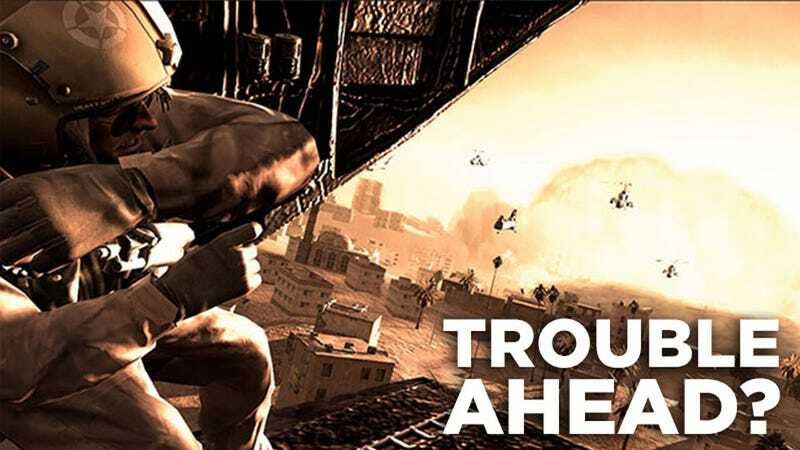 Our checks show initial sales of CoD: Black Ops II at some retailers were down as much as 20%. Subsequently, it appears sales of CoD did pick up a bit over the Thanksgiving holiday. We think the current sales curve suggests CoD: Black Ops II unit sales in its first year could ultimately be down 10% to 15% y/y. If we are right, this would be the second year in a row this critical franchise will have seen units decline (Call of Duty: Modern Warfare 3 is down an estimated 5% versus Call of Duty: Black Ops). We estimate CoD generates 40% to 45% of the company's EBIT on an annual basis and it goes without saying that weakness in this franchise is a cause for concern. We think there are possibly three reasons for the weakness in Black Ops II: 1) We note that ratings for Black Ops II on average were slightly lower than Modern Warfare 3, which may have impacted initial sell-through; 2) Black Ops II launched only a week after Halo 4, which could have impacted its sales; and 3) Black Ops II launched only a week before Thanksgiving, which may have caused some consumers to delay purchases in anticipation of potential deals/discounts. Going forward, investors should keep in mind that next year EA (Buy - $15.03) is expected to be back with its Battlefield franchise, the chief competitor to Call of Duty. In addition, Respawn Entertainment (the former Infinity Ward guys) could have a first-person shooter (FPS) out in 2014 under its agreement with EA, making the FPS market even more competitive. On the other hand, Activision's partnership with Tencent for Call of Duty Online in China should start to pay off in the upcoming years, although not likely before 2014. Reducing Estimates. We are lowering our 2013 revenue/EPS estimates to $4.3B/$0.85 from $4.74B/$1.10. Also, we are lowering our 2014 revenue/EPS estimates to $4.6B/$0.97 from $4.86B/$1.23. If you hate Call of Duty, maybe you're happy. Maybe you're predicting that CoD will go the way of Tony Hawk and Guitar Hero, other previously-annual franchises milked to dormancy by Call of Duty publisher Activision. Maybe you see this as the decline of the first-person shooter or the displacement of paid games with free-to-play. Certainly everyone will have a theory. But maybe you've played Black Ops II and, like me, are a little puzzled. I barely play CoD multiplayer. Just the campaigns. That means I don't play the parts of the series that fuel its popularity. Nevertheless, I could have sworn that MW3 was not as good a game as Black Ops II in any way, single player or multi. Yet the analysts here are saying that that Black Ops II got worse reviews than MW3. They're probably going by Metacritic, which has the 360 version of Black Ops II at an 83. That's an average of review scores. (57 "positive" reviews, 5 "mixed", zero "negative".) IGN gives it a 93, Gamespot an 80, Giant Bomb an 80. The Xbox 360 Metacritic for Modern Warfare 3 is 88. (79 "positive" reviews, 2 "mixed", zero "negative") IGN gives it a 90, GameSpot an 85, Giant Bomb an 80. It's not like quality automatically sells, but imagine if Black Ops II really is the better game over Modern Warfare 3. Imagine if Call of Duty goes in decline as it gets better?